The Theresienstadt Ghetto was created at the end of 1941 as a collection point for Jews of the former Czechoslovakia, and in the following months for Jews from Germany and Austria as well. A place with a complicated history of deception, starvation, slave labor, and periods of “beautification” for propaganda purposes, the Theresienstadt Ghetto’s primary purpose was as a way-station for further deportations to the death camps in Eastern Europe, most notably Treblinka and Auschwitz. Indeed, over half of the ghetto inhabitants perished in these places. In addition, over 30,000 of the prisoners died of disease brought-on by undernourishment and starvation in the ghetto itself. Nearly all of them were elderly. In May 1942, the Jewish Council instituted triage rationing: Children and laborers were allotted more food than those least likely to survive. The elderly became desperate scavengers, pouncing on piles of potato skins and rummaging in garbage. It was in this hell that Mina Pachter, who before the war had been an art historian and was now elderly herself, made this cookbook. Cover page of “In Memory’s Kitchen: A Legacy from the Women of Terezin,” edited by Cara De Silva. The actual trip the recipes took was long following the war. The manuscript travelled to Palestine, but meanwhile her daughter, Anny, had immigrated to the United States. It was only in 1969 the collected recipes reached her. And when they did, Anny could not bring herself to examine the package for years. 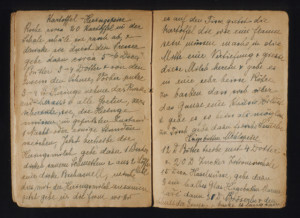 “It was like her hand was reaching out to me.” In addition to the recipe manuscript, the package included poems written by her mother, and a photograph of Mina Pachter with her grandson. 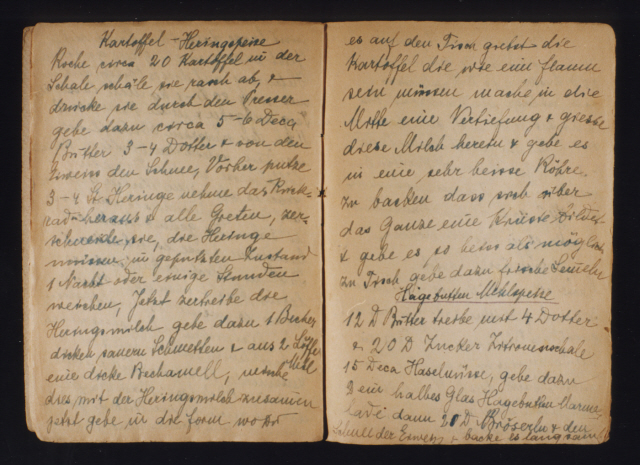 One of the handwritten pages of the original book features a recipe for a Kartoffel-Heringspeise, a meal with potatoes and herring. In 1996 the recipes were published in “In Memory’s Kitchen”. The original fragile, hand-sewn manuscript is now in the archives of the Holocaust Memorial Museum in Washington D.C. The reader of this cookbook should know that recipes are often not exact with regard to measurements or times. There is the usual assumption that a woman running a household knows the basics of cooking, such as how to make dough or how long something should be put in an oven and at what temperature. People who wish to actually make items will likely need to consult contemporary recipes as supplements to sometimes sparse directions. Perhaps more importantly is how the recipes serve as a memorial to the fate of the elderly women of Theresienstadt, and the destroyed world in which they once lived. Cara De Silva, ed. (1996). 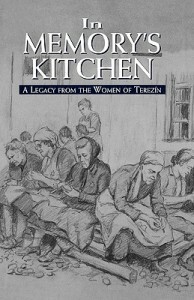 In Memory’s Kitchen: A Legacy from the Women of Terezin. Northvale, N.J.: Jason Aronson.